abs (abschrift) Indicates manuscript is copy. [ ] Brackets around Gregory-Aland number indicate the manuscript belongs to an already numbered manuscript, was found to not be a continuous text manuscript, was found to be written in modern Greek versus Koine Greek, was proved a forgery, or has been destroyed. 2319 ? Luke†, John† Owner unknown Berlin? 2320 ? Matthew† Owner unknown Berlin? ^ The two primary collections of manuscript images include the CSNTM ( "Manuscript Search". Center for the Student of New Testament Manuscripts. Retrieved 2016-07-07. ) and the INTF ( "Manuscript Workspace". Institut für Neutestamentliche Textforschung. Retrieved 2016-07-07. ) Other hosted images are referenced separately. ^ "Manuscript - Reg.gr.4". Digital Vatican Library. Retrieved 2017-05-31. ^ "Plut.09.10". Biblioteca Medicea Laurenziana. Retrieved 2017-08-29. ^ "Supplement Grec 1264". Bibliothèque nationale. Retrieved 2017-05-31. ^ "Hagios Sabas 217. Theodoret of Syria: Commentary on Paul. 14th cent. 195 f. Pa. 31 ft". Library of Congress. Retrieved 2017-08-29. ^ "Nicephorus Gregoras, Solutiones quaestionum philosophicarum. Gregory Nazianzen, works. Matthaeus Camariota, works. John of Damascus, works. Rhetorical and theological texts". Digital Bodleian. Retrieved 2017-06-22. ^ "Harley MS 5678". British Library. Retrieved 2017-06-22. ^ "Mscr.Dresd.A.124". Saxon State Library. Retrieved 2017-08-29. ^ "Collectio theologica de haeresibus". Austrian National Library. Retrieved 2017-08-28. ^ "Grec 19". Bibliothèque nationale. Retrieved 2017-05-31. ^ "Supplement Grec 99". Bibliothèque nationale. Retrieved 2017-05-31. ^ "Grec 491". Bibliothèque nationale. Retrieved 2017-05-31. ^ "Grec 239". Bibliothèque nationale. Retrieved 2017-05-31. ^ "Grec 241". Bibliothèque nationale. Retrieved 2017-05-31. ^ "Manuscript - Vat.gr.1904.pt.2". Digital Vatican Library. Retrieved 2017-05-31. ^ "Plut.07.09". Biblioteca Medicea Laurenziana. Retrieved 2017-08-29. ^ "Cod.graec. 544". Bavarian State Library. Retrieved 2017-08-13. ^ "Cod.graec. 23". Bavarian State Library. Retrieved 2017-08-13. ^ "Add MS 39612". British Library. Retrieved 2017-05-31. ^ "Commentarius in Apocalypsin". Austrian National Library. Retrieved 2017-08-28. ^ "Commentarius in Apocalypsin : Cap. 1-72 (Prologus deest)". Austrian National Library. Retrieved 2017-08-28. ^ "Commentarii in Apocalypsin". Austrian National Library. Retrieved 2017-08-28. ^ "Grec 240". Bibliothèque nationale. Retrieved 2017-05-31. ^ "Coislin 256". Bibliothèque nationale. Retrieved 2017-09-05. ^ "Plut.07.29". Biblioteca Medicea Laurenziana. Retrieved 2017-08-29. ^ "Roma, Biblioteca Angelica, Manoscritti greci, Ang. gr. 57". Internet Culturale. Retrieved 2017-09-13. ^ "Roma, Biblioteca Angelica, Manoscritti greci, Ang. gr. 32". Internet Culturale. Retrieved 2017-09-13. ^ "Manuscript - Chig.R.V.33". Digital Vatican Library. Retrieved 2017-09-12. ^ "Manuscript - Vat.gr.370". Digital Vatican Library. Retrieved 2017-05-31. ^ "Manuscript - Vat.gr.1190.pt.1". Digital Vatican Library. Retrieved 2018-11-29. ^ "Manuscript - Vat.gr.2129". Digital Vatican Library. Retrieved 2017-05-31. ^ "Manuscript - Ott.gr.154". Digital Vatican Library. Retrieved 2016-08-19. ^ "Manuscript - Ott.gr.283". Digital Vatican Library. Retrieved 2016-08-19. ^ "Mscr.Dresd.A.187". Saxon State Library. Retrieved 2017-08-29. ^ "Greek Manuscripts 277. Praxapostolos". Library of Congress. Retrieved 2017-05-11. ^ "Greek Manuscripts 278. Praxapostolos". Library of Congress. Retrieved 2017-05-11. ^ Parker, D. C. (2008). An Introduction to New Testament Manuscripts and their Texts (PDF). Cambridge University Press. p. 41. ISBN 978-0-511-41419-0. Retrieved 2016-07-14. ^ "Digitised Manuscripts". The British Library. Retrieved 2016-07-08. ^ "Euthymius Zigabenus, Commentaries on four Gospels. Etc". Digital Bodleian. Retrieved 2017-06-22. ^ "Theophylact, Commentary on St. Paul's Epistles. Gregory Nazianzen, Homilia in resurrectionem. Life of St. Alexius. Etc". Digital Bodleian. Retrieved 2017-06-22. ^ "Catena on St. John's Gospel". Digital Bodleian. Retrieved 2017-06-22. ^ "MS. E. D. Clarke 42". Bodleian Library. Retrieved 2018-05-07. ^ "MS. Auct. E. 1. 6". Bodleian Library. Retrieved 2018-05-07. ^ "MS. Auct. T. 2. 1". Bodleian Library. Retrieved 2018-05-07. ^ "MS. Cromwell 17". Bodleian Library. Retrieved 2018-05-07. ^ "Grec 702". Bibliothèque Nationale. Retrieved 2017-05-31. ^ "Fragments de manuscrits". Bibliothèque Nationale. Retrieved 2016-07-08. ^ "Supplement Grec 1282". Bibliothèque Nationale. Retrieved 2016-07-08. ^ "New Testament-Psalter". Free Library of Philadelphia. Retrieved 2017-06-27. ^ "W.530.C, The Four Evangelists and Two Apostles". The Digital Walters. Retrieved 2016-08-04. ^ "Manuscript - Ross.135". Digital Vatican Library. Retrieved 2016-08-19. ^ "Manuscript - Ross.136". Digital Vatican Library. Retrieved 2017-09-12. ^ "Manuscript - Ross.137". Digital Vatican Library. Retrieved 2017-09-12. ^ "Manuscript - Ross.138". Digital Vatican Library. Retrieved 2017-09-12. ^ "Gospel Book" (PDF). Leimonos Monastery. Retrieved 2017-06-28. ^ "W.523, Gospel Book". The Digital Walters. Retrieved 2016-08-04. ^ "Ms. 138, The Goodspeed Manuscript Collection". The University of Chicago Library. Retrieved 2016-08-02. ^ "Monastery of Mega Spileo - Kalavrita". Monasteries of Greece. Retrieved 2018-06-18. ^ "Supplement Grec 1299". Bibliothèque Nationale. Retrieved 2016-07-08. ^ "Hagios Sabas 149. Theophylact: Commentary on Paul. 14th cent. 302 f. Pa. 46 ft". Library of Congress. Retrieved 2017-08-29. ^ "Ms. 727, The Goodspeed Manuscript Collection". The University of Chicago Library. Retrieved 2016-08-02. ^ "New Testament, Gospel of St. Mark". Duke University Libraries Digital Collections. Retrieved 2017-06-23. ^ "Add MS 37001". British Library. Retrieved 2017-06-22. ^ "Add MS 37002". British Library. Retrieved 2017-06-22. ^ "Add MS 37003". British Library. Retrieved 2017-06-22. ^ "Add MS 36752". British Library. Retrieved 2017-06-22. ^ "Pauline Epistles". Gothenburg University Library. Retrieved 2017-09-14. ^ "Add MS 37320". British Library. Retrieved 2017-06-22. ^ "Add MS 37485". British Library. Retrieved 2017-06-22. ^ "Add MS 37486". British Library. Retrieved 2017-06-22. ^ "Tetraeuangelion". Austrian National Library. Retrieved 2017-08-28. ^ "Actes des Apôtres et Epîtres". Bibliothèque Nationale. Retrieved 2016-07-08. ^ "Hagios Sabas 537. Apocalypse with Commentary of Andreas of Caesarea. 14th cent. 71 f. Pa. 9 ft". Library of Congress. Retrieved 2017-08-29. ^ "Hagios Sabas 605. Four Gospels, Acts, etc. 10th, 12th, 14th cent. 81 f. Pg. & Pa. 10 ft". Library of Congress. Retrieved 2017-08-29. ^ "Hagios Sabas 617. Praxapostolos, etc. 14th cent. 241 f. Pa. 22 ft". Library of Congress. Retrieved 2017-08-29. ^ "The four gospels in Greek : Codex Torontonensis : manuscript". University of Toronto Libraries. Retrieved 2017-09-14. ^ "HRC_24" (PDF). Harry Ransom Humanities Research Center. Retrieved 2016-07-08. ^ "Bible. N. T. Gospels, 'Hoffman Gospels'". Yale University Library. Retrieved 2017-06-27. ^ "Supplement Grec 1316". Bibliothèque nationale. Retrieved 2017-05-11. ^ "Coislin 18". Bibliothèque nationale. Retrieved 2017-05-11. ^ "Greek Manuscripts 1591. Four Gospels". Library of Congress. Retrieved 2017-05-11. ^ "Greek Manuscripts 1594. New Testament". Library of Congress. Retrieved 2017-05-11. ^ "Manuscript - Barb.gr.372". Digital Vatican Library. Retrieved 2016-08-19. ^ "Manuscript - Vat.gr.1205". Digital Vatican Library. Retrieved 2017-06-22. ^ "W.527, Gospel Book". The Digital Walters. Retrieved 2016-08-04. ^ "W.523, Gospel Book". The Digital Walters. Retrieved 2017-06-23. ^ "W.522, Gospel Book". The Digital Walters. Retrieved 2016-08-04. ^ "W.528, Gospel Book". The Digital Walters. Retrieved 2016-08-04. ^ "W.524, Gospel Book". The Digital Walters. Retrieved 2016-08-04. ^ "W.525, New Testament". The Digital Walters. Retrieved 2016-08-04. ^ "W.531, Trebizond Gospels". The Digital Walters. Retrieved 2016-08-04. ^ "Gospel Book with Commentaries, c. 1000-1100". The Cleveland Museum of Art. Retrieved 2017-06-26. ^ "Gospel Book". The Morgan Library and Museum. Retrieved 2017-06-27. ^ "Supplement Grec 1356". Bibliothèque nationale. Retrieved 2017-05-11. ^ "Supplement Grec 1341". Bibliothèque nationale. Retrieved 2017-05-11. ^ "Fragments de deux manuscrits des évangiles". Bibliothèque nationale. Retrieved 2017-05-11. ^ "Ms. 131, The Goodspeed Manuscript Collection". The University of Chicago Library. Retrieved 2016-08-04. ^ "Ms. 133, The Goodspeed Manuscript Collection". The University of Chicago Library. Retrieved 2016-08-04. ^ "Ms. 135, The Goodspeed Manuscript Collection". The University of Chicago Library. Retrieved 2016-08-04. ^ "Ms. 132, The Goodspeed Manuscript Collection". The University of Chicago Library. Retrieved 2016-08-04. ^ "Ms. 137, The Goodspeed Manuscript Collection". The University of Chicago Library. Retrieved 2016-08-04. ^ "Ms. 965, The Goodspeed Manuscript Collection". The University of Chicago Library. Retrieved 2016-08-04. ^ "Ms. 142, The Goodspeed Manuscript Collection". The University of Chicago Library. Retrieved 2016-08-04. ^ "Ms. 931, The Goodspeed Manuscript Collection". The University of Chicago Library. Retrieved 2016-08-04. ^ "Ms. 126, The Goodspeed Manuscript Collection". The University of Chicago Library. Retrieved 2016-08-04. ^ "Ms. 130, The Goodspeed Manuscript Collection". The University of Chicago Library. Retrieved 2016-08-04. ^ "Ms. 134, The Goodspeed Manuscript Collection". The University of Chicago Library. Retrieved 2016-08-04. ^ "Ms. 136, The Goodspeed Manuscript Collection". The University of Chicago Library. Retrieved 2016-08-04. ^ "Ms. 141, The Goodspeed Manuscript Collection". The University of Chicago Library. Retrieved 2016-08-04. ^ "Ms. 828, The Goodspeed Manuscript Collection". The University of Chicago Library. Retrieved 2016-08-04. ^ "Ms. 922, The Goodspeed Manuscript Collection". The University of Chicago Library. Retrieved 2016-08-04. ^ "Supplement Grec 159". Bibliothèque nationale. Retrieved 2017-05-11. ^ "Four Gospels, 1296". Princeton University Art Museum. Retrieved 2016-08-04. ^ "Ms. 943, The Goodspeed Manuscript Collection". The University of Chicago Library. Retrieved 2016-08-04. ^ "Ms. 972, The Goodspeed Manuscript Collection". The University of Chicago Library. Retrieved 2016-08-04. ^ "Grec 746". Bibliothèque nationale. Retrieved 2017-05-11. ^ "Grec 1002". Bibliothèque nationale. Retrieved 2017-05-11. ^ "Manuscript - Ross.766". Digital Vatican Library. Retrieved 2017-05-11. ^ "Evangelho Greco". National Library of Brazil. Retrieved 2018-09-04. ^ "Lectionary of Acts and Epistles". Gothenburg University Library. Retrieved 2017-09-14. ^ "Ms. 1054, The Goodspeed Manuscript Collection". The University of Chicago Library. Retrieved 2016-08-04. ^ "LAVRA MONASTERY NEW TESTAMENT". The Schøyen Collection. Retrieved 2017-08-15. ^ "Add MS 38538". British Library. Retrieved 2017-06-22. ^ "Add MS 41180". British Library. Retrieved 2017-06-22. ^ "MS. Auct. F. 6. 1". Bodleian Library. Retrieved 2018-05-07. ^ "MS. Lyell 91". Bodleian Library. Retrieved 2018-05-07. ^ "Gospel of Matthew XXII, 31-XXIII, 10". Duke University Libraries Digital Collections. Retrieved 2018-11-09. ^ "Greek Greek Manuscripts 1342. New Testament and III and IV Maccabees". Library of Congress. Retrieved 2017-05-11. ^ "Greek Manuscripts 1692. Patristica". Library of Congress. Retrieved 2017-09-15. ^ "Greek Manuscripts 1991. New Testament". Library of Congress. Retrieved 2017-05-11. ^ "Greek Manuscripts 1992. New Testament". Library of Congress. Retrieved 2017-05-11. ^ "Greek Manuscripts 1993. Four Gospels". Library of Congress. Retrieved 2017-05-11. ^ "Greek Manuscripts 1994. Unidentified Menologion". Library of Congress. Retrieved 2017-05-11. ^ "Greek Manuscripts 2038. Four Gospels". Library of Congress. Retrieved 2017-05-11. ^ "Greek Manuscripts 2051. Praxapostolos". Library of Congress. Retrieved 2017-05-11. ^ "Greek Manuscripts 2123. New Testament with Psalter". Library of Congress. Retrieved 2017-05-11. ^ "Greek Manuscripts 2252. Four Gospels". Library of Congress. Retrieved 2017-05-11. ^ "A 172 sup". Veneranda Biblioteca Ambrosiana. Retrieved 2017-09-12. ^ "A 184 sup". Veneranda Biblioteca Ambrosiana. Retrieved 2017-09-12. ^ "D 161 inf". Veneranda Biblioteca Ambrosiana. Retrieved 2017-09-12. ^ "Manuscript - Vat.gr.1908". Digital Vatican Library. Retrieved 2017-05-11. ^ "Manuscript - Vat.gr.2275". Digital Vatican Library. Retrieved 2017-05-11. ^ "Manuscript - Vat.gr.2330". Digital Vatican Library. Retrieved 2017-05-11. ^ "Manuscript - Vat.gr.2503". Digital Vatican Library. Retrieved 2017-05-11. ^ "Manuscript - Vat.gr.2561". Digital Vatican Library. Retrieved 2017-05-11. ^ "MS. Auct. T. inf. 1. 4". Bodleian Library. Retrieved 2018-05-07. ^ "Ms. Gr. 22". Houghton Library, Harvard University. Retrieved 2016-08-08. ^ "Ms. 202, The Goodspeed Manuscript Collection". The University of Chicago Library. Retrieved 2016-08-08. ^ "Ms. 62, The Goodspeed Manuscript Collection". The University of Chicago Library. Retrieved 2016-08-08. ^ "New Testament Gospels". Duke University Libraries Digital Collections. Retrieved 2017-06-23. ^ "New Testament, Gospels". Duke University Libraries Digital Collections. Retrieved 2017-06-23. ^ "Acts of the Apostles and Revelation". Yale University Library. Retrieved 2017-06-27. ^ "Gospels". Yale University Library. Retrieved 2017-09-19. ^ "Gospel book: the Evangelist Luke, ca. 1380". Retrieved 2017-06-23. ^ "Digital Assets". University of California, Berkeley. Retrieved 2016-08-09. ^ "Gospel Lectionary" (PDF). Leimonos Monastery. Retrieved 2017-06-28. ^ Only a portion of the pages available. ^ "Manuscript - Arch.Cap.S.Pietro.D.157". Digital Vatican Library. Retrieved 2016-08-19. ^ "Manuscript - Vat.gr.642". Digital Vatican Library. Retrieved 2017-05-31. ^ "Manuscript - Vat.gr.1571". Digital Vatican Library. Retrieved 2017-05-31. ^ "Manuscript - Vat.lat.125". Digital Vatican Library. Retrieved 2016-08-19. ^ "Ms. 902, The Goodspeed Manuscript Collection". The University of Chicago Library. Retrieved 2016-08-21. ^ "Gospels". Bodleian Library. Retrieved 2018-11-12. ^ "New Testament, Gospels". Duke University Libraries Digital Collections. Retrieved 2018-11-09. ^ "Quaestiones et solutiones in evangelium Matthaei. Eclogae variorum interpretum in evangelium secundum Ioannem [u.a.] - BSB Cod.graec. 208". Munchener DigitalisierungsZentrum Digitale Bibliothek. Retrieved 2016-08-20. ^ "Manuscript - Vat.gr.1853". Digital Vatican Library. Retrieved 2017-05-11. ^ "Manuscript - Vat.gr.1909". Digital Vatican Library. Retrieved 2017-05-11. ^ "Greek MS 100". Duke University. Retrieved 2018-11-08. ^ "Liber Pastoris : Fragmentum". Austrian National Library. Retrieved 2017-08-28. ^ "Los cuatro Evangelios con el comentario de Pseudo Petrus Laodicenus". BIBLIOTECA DIGITAL HISPÁNICA. Retrieved 2017-05-11. ^ "Kommentar zur Johannesapokalypse - UB Augsburg - Oettingen-Wallersteinsche Bibliothek Cod.I.1.4.1". Digitale Sammlungen der Universitätsbibliothek Augsburg. Retrieved 2018-11-15. ^ "Supplement Grec 1035". Bibliothèque nationale. Retrieved 2017-06-23. ^ "Add MS 11860". British Library. Retrieved 2017-05-11. ^ "Hagios Stavros 94. New Testament. 12th-14th cent. 252 f. Pg. 34 ft". Library of Congress. Retrieved 2017-08-29. ^ "Manuscript - Vat.gr.1190.pt.3". Digital Vatican Library. Retrieved 2017-05-11. ^ "MS. Holkham Gr. 30". Bodleian Library. Retrieved 2018-05-07. ^ "Grec 977". Bibliothèque nationale. Retrieved 2017-05-11. ^ "Grec 1060". Bibliothèque nationale. Retrieved 2017-05-11. ^ "Grec 1164". Bibliothèque nationale. Retrieved 2017-05-11. ^ "Greek MS 064". Duke University. Retrieved 2018-11-08. 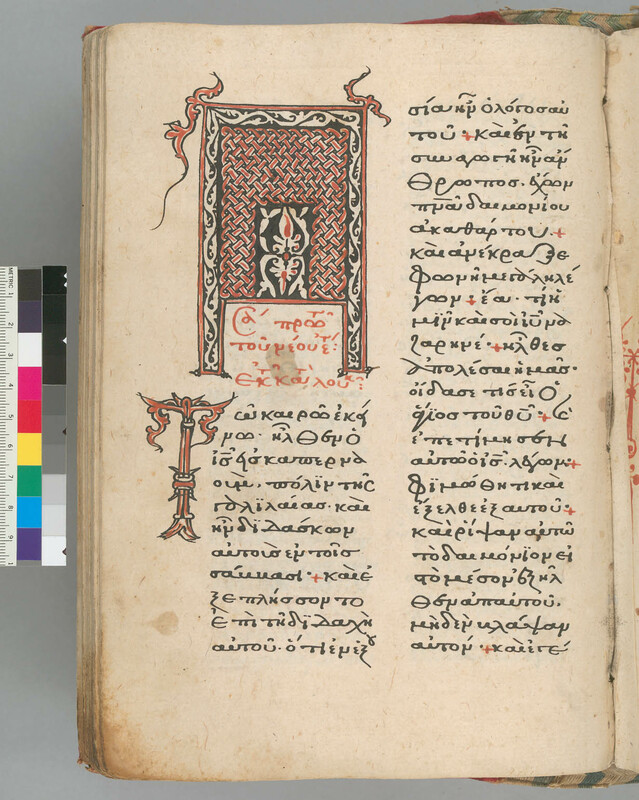 ^ "Greek MS 084". Duke University. Retrieved 2018-11-08. ^ "Typ. 294". Harvard University, Hougton Library. Retrieved 2017-06-26. ^ "MS Typ 491". Harvard University, Hougton Library. Retrieved 2017-06-26. ^ "Grec 194 A". Bibliothèque nationale. Retrieved 2017-05-11. ^ "Matthew (fragment). manuscript. Byzantine East, 12th-13th centuries". Yale University Library. Retrieved 2017-06-27. ^ "MS. Lyell 95". Bodleian Library. Retrieved 2018-05-07. ^ "BSB-Hss Cod.graec. 455". Bavarian State Library. Retrieved 2017-08-15. ^ "A 241 inf". Veneranda Biblioteca Ambrosiana. Retrieved 2017-09-12. ^ "Saint Mark". The J. Paul Getty Museum. Retrieved 2017-06-26. ^ "Grec 82". Bibliothèque Nationale. Retrieved 2016-08-26. ^ "Coislin 202 bis". Bibliothèque Nationale. Retrieved 2017-09-05. ^ "Hagios Sabas 676. Praxapostolos. 12th, 16th cent. 263 f. Pg. & Pa. 19 ft". Library of Congress. Retrieved 2017-08-29. ^ "Supplement Grec 475". Bibliothèque nationale. Retrieved 2017-05-31. ^ "Gospel of John". Yale University Library. Retrieved 2017-06-27. ^ "Evangeliar : mit Initialen und Miniaturen". Herzogin Anna Amalia Bibliothek. Retrieved 2019-04-08. This page was last edited on 23 April 2019, at 00:36 (UTC).